We used to have 2, the Mum, Kushla and her son Sultan. 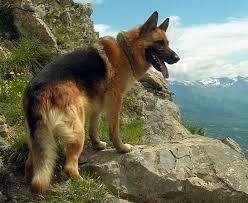 I'll try to get a picture tonight because dogs are my favorite animal and German Shepards are my favorite breed. Do you have any horses M? @Goku_Ironheart I also like German shepherd too as my breed too! No but I really want one! We might of had one already but we don't own the house yet! Were did you get that picture?? Everyone, amazing dogs and cats! I love every single one of them. Super cute! I wanna hug all of them!!!!!! His fur looks so smooth! Dixie is in my room right now it's 9:37 central time!! That's why they are called: "Man's Best Friend!" And I love goats a lot! He is a very nice looking dog!